GOSHEN—Two weeks ahead of schedule and on budget, work on Route 207, which turns into Main Street and Greenwich Avenue in the Village of Goshen, has been completed, the state Department of Transportation (DOT) announced on Aug. 4. The nearly two-mile stretch of road was repaved, with 19 crosswalks installed, and 32 sidewalk curbs, 14 manholes, and 22 catch basins repaired or replaced. 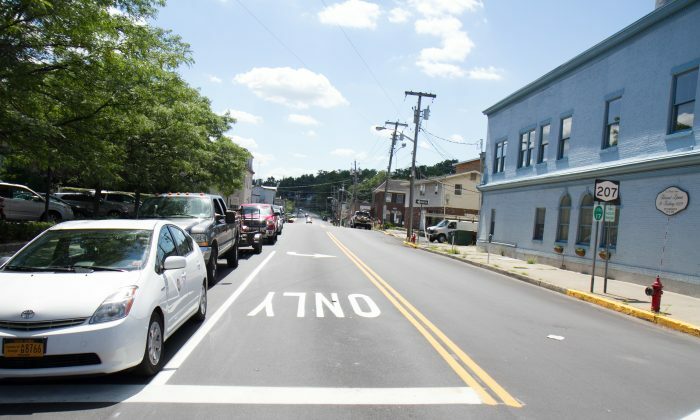 DOT officials said the project came in ahead of schedule because of cooperation with the community, and Town Supervisor Doug Bloomfield said he received no complaints about the work since it started in April. “And yet prior to that, I can’t count on both hands each week the complaints about the status of the road,” he said. Because it was not in the DOT Region 8’s five-year plan, Skoufis secured a state grant of up to $3 million for the project. The winning bid, from Kubricky Construction Corp., was $2.4 million. The work was done at night so local and state officials said there was little disturbance to area residents. What people will notice, they said, is the difference in the road’s aesthetics and functionality.